Airline travel and fine dining - will the two ever meet? Why yes! At least if you're flying Scandinavian Airlines. Right now, you'll find both This Is Nuts California Almond Supreme and the brand new This Is Nuts Luxurious Wing Nuts on SAS' in-flight menu. If you happen to travel SAS Business or SAS Plus, your nuts are complimentary and even served heated. This Is Nuts' partnership with SAS goes back nearly four years, and we're extremely proud to be a part of the airline's "We are Travelers" concept, a campaign that aims to give passengers an experience that goes beyond just getting from point A to point B. That means serving foods from hand-picked, Scandinavian producers with a proven commitment to high quality. As it turns out, SAS thinks our premium, locally roasted nuts and nut mixes are a perfect fit. "We know that food and drinks are an important part of the traveling experience," says Jeanet Andersen, digital marketing specialist for SAS. "That's why we always work hard to find both the best products and partners from local distributors. We're Scandinavia's leading airline and we want that to be reflected in the food and drink service on board as well." This Is Luxurious Wing Nuts is an exquisite mix of five of our most beloved nuts: macadamia, pistachios, cashews, almonds and hazelnuts, all carefully roasted and salted to perfection. 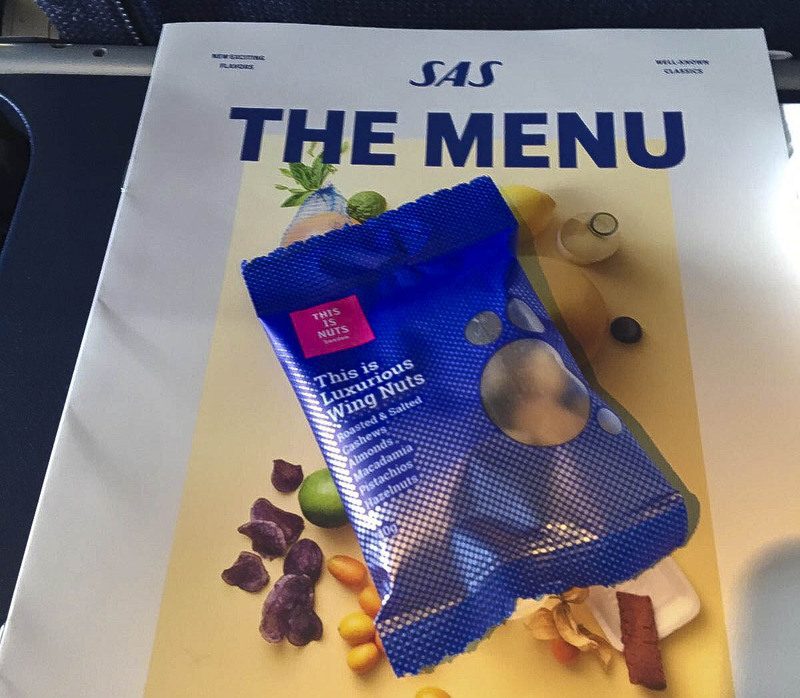 The new, bright blue snack bag was developed specifically for SAS and customized to meet the airline's specific requirements. "Everything we offer has to be customized to fit the ambiance of our airplanes, everything from the size of the package to the roasting quality and salt levels," Andersen says. "In order to offer the freshest nuts, working with This Is Nuts is a given, since everything is done locally." The goal of serving only the freshest, highest quality nuts also means that SAS rotates This Is Nuts' mixes depending on which nuts are in season. Right now, California Almond Supreme and This Is Nuts Luxurious Wing Nuts are on the menu; come fall it will likely be something else. "Our nut mixes are perfect for everyday travelers and people on the go," says This Is Nuts CEO Ranja Maria Vardali about the partnership. "Plus, we wholeheartedly share SAS' view that traveling should be a special treat, both for your body, mind and taste buds." So the next time you fly SAS, keep an eye out for our nuts and treat your taste buds to something truly special!